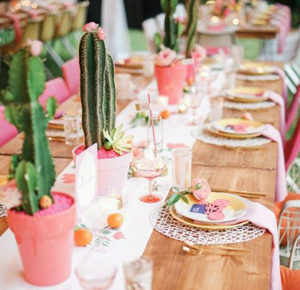 Easter table ideas from a top South African Wedding Planner. This year, Easter is on Sunday 16th April which is not far away so let’s get creative. For many, the thought of Easter conjures up thoughts of Spring (from the European influence), of green fields, tulips and daffodils; of soft pinks, delicate white Easter bunny’s and soft pastels. For others, brighter bolder reds, yellows and oranges seem more appropriate. Whatever the case, when choosing your Easter scheme think about all the colours that make you happy and remind you of Spring. White table cloths always provide a good blank canvas to start with and build layers of colour upon. White also adds a freshness that comes with new beginnings and most importantly contrasts well with pink, orange & yellow tulips or fluffy hydrangeas and then combined with gold (or rose-gold) cutlery. We often use this fresh, light “new beginnings” approach for our weddings but it works so well for Easter too. There is often a lot of confusion as to “what goes where” when laying a formal dining table for entertaining your guests and if you would like to lay your table like a pro, we recommend you follow some of these essential guidelines for getting it right. -Always have a red wine glass, a white wine glass, a champagne glass (if you are serving champagne) and a water glass. Never expect your guests to drink red wine from a white wine glass if you want to be truly classy. -Your guests should start using cutlery for each course from the outside, in, so make sure your cutlery is placed in the same order that is being served. Usually the smaller cutlery is used for starters. -Always use some sort of table mat. Whether it is heat protective or not, it sets the scene and pulls the whole scheme together. It’s also an area that allows you to be creative. your place mats can be personalised in line with the theme, in this case Easter. -If you can, try to give each guest their own salt and pepper shaker as it stops people having to stretch across of interrupt conversations. Another idea which we can cross-reference from our Wedding Tables is the idea of little games to keep guests entertained and to make the day even more memorable. It’s especially good for people that may be sitting next to each-other that haven’t met to help break the ice. For family Easter parties however, this table idea can be adapted the get the whole family to take part and interact with each-other in a different way to normal. This is especially exciting for small children. Instead of having an Easter Egg hunt in the Garden or around the house this year, why not have it at the table. 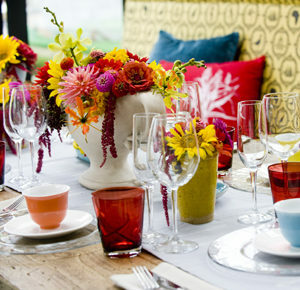 Eggs can be hidden amongst the flower arrangements, within napkins, to the underside of the table and inside coffee cups and coloured tumblers. One of my many favourites is to spray paint an old wooden crate in a colour to match your scheme. Let it dry and paste a home-made banner to the front saying HAPPY EASTER!!! 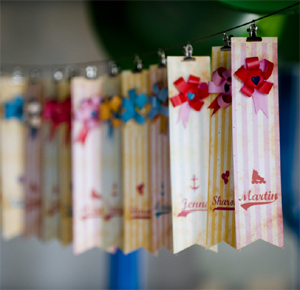 Alternatively, attach some beautiful home-made bunting to match your colour scheme. 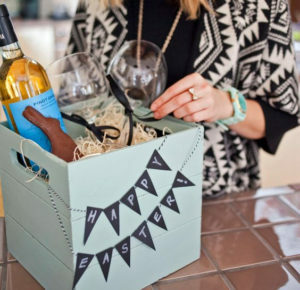 Then fill the crate with crumpled crate paper or packing ribbon and delicately place a bottle of gorgeous rosé wine into the box, with a couple of wine glasses and off course, Easter chocolates & lots of lovely coloured Easter eggs. 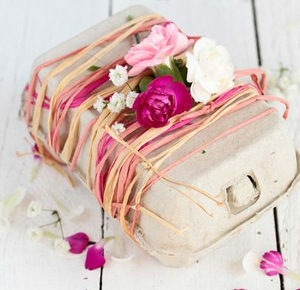 Why not decorate egg boxes as table gifts that can be positioned in and amongst the flower arrangements and filled with chocolate eggs or other gifts. 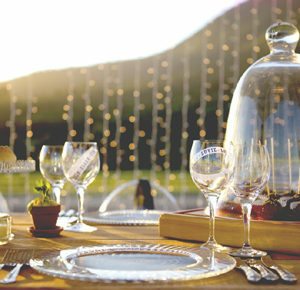 Impress your guests with individual place names or name tags attached to each place, seat or glass. Make it even more special by using your guests nicknames for a little more table laughter; your guests will LOVE you for that. Impress even more by making elements of your table decor edible, like cake pops (lollipops, but as cakes or brownies on sticks). Otherwise try individual mini pot plants containing mini breads or dips; one of my favourites is hummus mousse with a pistachio nut crust. Whatever your preferences, most families or groups of friends will celebrate Easter by entertaining family or friends around the dining table and with a little effort and preparation and some quirky ideas for your Easter Table this year, you are likely to be able to blow your guests away in admiration!